Chelsea had an opportunity to close the gap on other top 4 rivals when they took on Everton. 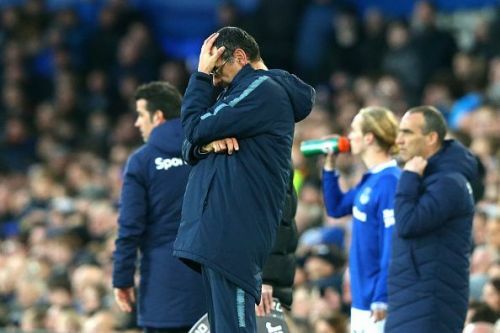 Maurizio Sarri's could have been just one point short of third-placed Tottenham if they had won their game in hand. While Chelsea has been poor away from home, Everton has an even poorer record against the top 6 in the last few years. Everton's last win against the 'big 6' of the Premier League came against Manchester City in January 2017. Chelsea started the match on a positive note and them taking the lead just seemed to be a matter of time. As the game went on, Everton grew into the game but Chelsea was surely the better team in the first half. Marco Silva's team talk seemed to have done wonders as Everton scored early in the second half through Richarlison. After taking the lead, the home team seemed to gain confidence as Chelsea was chasing the game. Marcos Alonso conceded a cheap penalty by clipping Richarlison which meant Gylfi Sigurdsson had a chance to double the lead for the Toffees. Kepa guessed the penalty right and managed to save the penalty. The Iceland dead ball specialist was alive to the opportunity as he scored off the rebound to double his team's advantage. This goal meant that it was almost impossible for Chelsea to mount a comeback. This is Chelsea's fourth loss in the last five away matches in the Premier League. In this disastrous run, they have failed to score in four matches and won just against 19th placed Fulham. Chelsea's aggregate score in this horrible run of games has 2-15 which means that pressure would increase on Maurizio Sarri. Chelsea board is known for being strict with the managers. If Chelsea can't ensure UCL qualification by either finishing in top 4 or by winning the Europa League, the Italian manager might lose his job. One of Arsenal, Chelsea, Man United and Spurs are going to have to be big Man City fans. Because if City do not win the FA Cup, then 6th in the Prem will start in the second qualifying round of the Europa League... on July 25. I find it so strange that Sarri always brings on RLC and CHO when Chelsea are losing. He brings them on to rescue the game which clearly indicates that he knows the qualities of these two players and yet he decides not to start them. “Hazard will be illegal under Sarri”.